Phyllis Bennis directs the New Internationalism Project at the Institute of Policy Studies. Palestinian Chairman Mahmoud Abbas’ speech to the United Nations General Assembly was as much about trying to reclaim his dwindling support among Palestinians as it was designed to outline Palestine’s intention to move for a new status at the UN. The consequence of “non-member state” status, while not granting full UN membership, would provide a UN imprimatur to the identity of Palestine as a state, meaning it would have the right to sign treaties. Of particular significance would be Palestine joining the Rome Treaty as a signatory to the International Criminal Court. That would, at least potentially, enable an ICC investigation of potential Israeli war crimes on Palestinian territory. Beyond his anticipated call for the new UN recognition as a “state,” much of Abbas’ speech focused on Israeli violations of international law, particularly the Geneva Conventions. 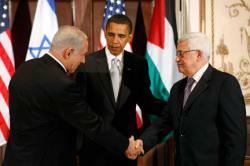 While he issued his usual call for resuming peace talks with Israel, he called for the United Nations, specifically the Security Council, to pass a binding resolution setting out the terms of reference for any renewed diplomatic process, something that seems to contradict his longstanding willingness to allow unchallenged U.S. control of the negotiating process. Netanyahu’s speech focused almost solely on Iran, comparing it to Nazi Germany and calling for the world to join his crusade against it. He spoke derisively of those who claim that a nuclear-armed Iran might stabilize the Middle East, looking up from his prepared notes with a sarcastic “yeah, right.” Interestingly, he reminded the world — seemingly as a point of pride — that he had been speaking about “the need to prevent Iran from developing nuclear weapons for over 15 years.” It apparently didn’t appear to his speechwriting team that this admission, when all of those earlier warnings were shaped by the same “it’s almost too late” rhetoric that we heard today, might somehow discredit his unchanging claim. 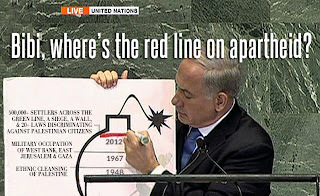 Ignoring the fact that the United States, unfortunately, already has an “all options on the table” red line of its own (preventing Iran from obtaining a bomb), Netanyahu called on the United States to endorse his own specific red line for using force against Iran. 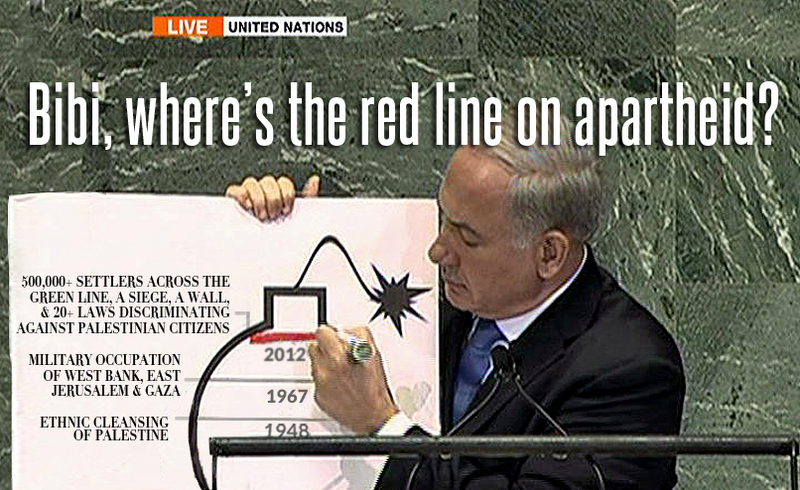 He set his red line as Iran’s ability to enrich uranium to bomb grade, and demanded that the U.S. join. While Iran has not enriched anywhere close to that level, Netanyahu’s language reflected his red line on Iran’s “capability,” a line that he argued is almost here. He spoke on the need to attack Iranian facilities while they are “still visible and still vulnerable.” Perhaps taking a lesson from then-Secretary of State Colin Powell’s use of fake “anthrax” props when trying to persuade the Security Council of the need to go to war against Iraq in 2002, Netanyahu held up a primitive grade-school level poster prop and used insulting “this is a bomb, this is a fuse” language. Netanyahu’s overall language, however, was significantly more conciliatory towards President Obama than much of his recent rhetoric. Perhaps it was the cohort of Jewish Democratic Party heavyweights who scolded the Israeli prime minister for interfering in U.S. politics, or perhaps it was his U.S. advisers, or perhaps his own political team at home — but whatever the reason, Netanyahu’s overt embrace of all things Romney, and his disdain for all things Obama, was kept well under wraps in New York.